Read All of the Instructions Before Beginning your Installation. Locate a desirable position for the battery and box. Ideally the area behind the right rear tire is the best location for weight transfer. Make sure that the area beneath the selected location is clear of all brake lines, electrical wiring, frame, fuel cell (gas tank), fuel lines and spare tire before drilling. Insert the battery into the box and place the H-frame over the top of the battery. Center the battery in the box being careful to note the locations for the battery cables (2 large holes on the long side of box) in reference to the terminals. Slide the threaded rod into the H-frame and mark the location of the holes to be drilled into the base of the battery box. Remove the box from the mounting location and use a center punch to dimple the base of the box. Drill 3/8” holes into the base. Using the base of the box as a template, mark the holes to be drilled in the mounting surface, once again checking for clearance as described in step 2 prior to drilling the holes in the mounting surface. Use a center punch to dimple the mounting surface. Drill 3/8” holes into the mounting surface. 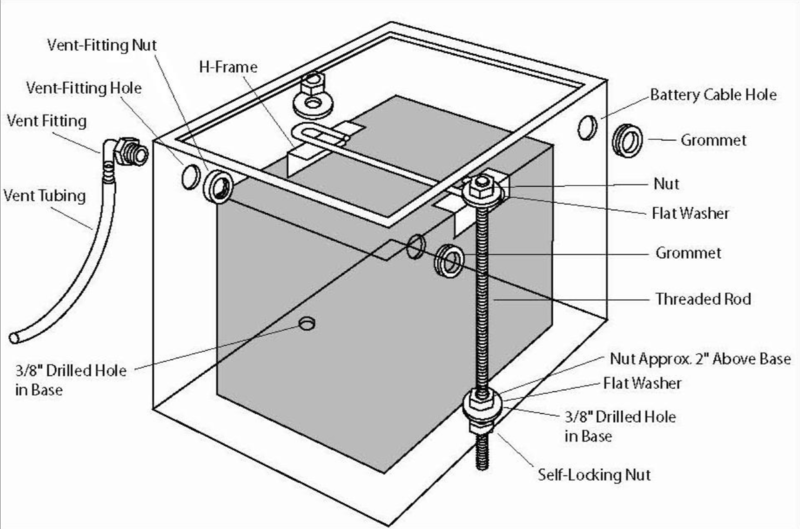 Assemble the threaded rod with a nut about 2” from the bottom and insert through the box and the mounting surface as described in illustration. Install a flat washer and a self locking nut from the bottom and snug into place. Do not fully tighten. Install the supplied grommets and vent fitting into the proper holes. Attach the plastic vent tubing and route outside of compartment. Insert the battery into the box and place the H-frame over the top of the battery and the threaded rods. Install a flat washer and a nut to the top of the threaded rod and snug into place. Adjust the threaded rod up or down depending on the height of your battery. Make certain that the lid will clear the top of the threaded rod assembly. Tighten the nuts securely. Attach and secure the mounting hardware for the lid. Select a route for the battery cables avoiding objects that might damage the cable. Use JEGS Battery Cable Kit #555-10303. Our kit also includes a ground strap to help eliminate charging and starting problems. The JEGS Thru Panel Connector #555-10317 may be used instead of a rubber grommet to run the positive cable to the solenoid or starter. Our connector has a stud and nut on both sides for quick and easy installation. On race only type vehicles we recommend the JEGS Positive and Negative Remote Charging Terminals #555- 10315 and 555-10316 in addition to the JEGS Master Disconnect Switch and Faceplate #555-10305 and 555- 10306.